ab20655 is able to recognise a band at 115kDa corresponding to the long isoform of HIRA/HIR and a band at 89kDa, corresponding to the short isoform of HIRA/HIR in HepG2 nuclear extract. Synthetic peptide corresponding to Human HIRA/HIR aa 1000 to the C-terminus (C terminal) conjugated to keyhole limpet haemocyanin. 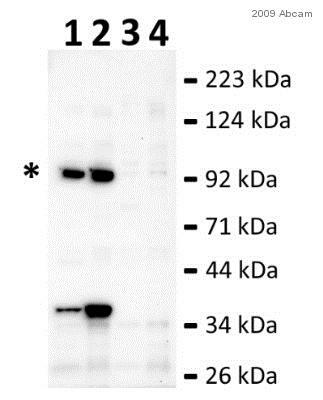 This antibody gave a positive signal in the following whole cell lysate: HepG2 nuclear extract. Our Abpromise guarantee covers the use of ab20655 in the following tested applications. Detects a band of approximately 89 kDa, corresponding to the short isoform of HIRA/HIR. Cooperates with ASF1A to promote replication-independent chromatin assembly. Required for the periodic repression of histone gene transcription during the cell cycle. Required for the formation of senescence-associated heterochromatin foci (SAHF) and efficient senescence-associated cell cycle exit. Expressed at high levels in kidney, pancreas and skeletal muscle and at lower levels in brain, heart, liver, lung, and placenta. Belongs to the WD repeat HIR1 family. Phosphorylated by CDK2/CCNA1 and CDK2/CCNE1 on Thr-555 in vitro. Also phosphorylated on Thr-555 and Ser-687 in vivo. Nucleus. Nucleus > PML body. Primarily, though not exclusively, localized to the nucleus. Localizes to PML bodies immediately prior to onset of senescence. ab20655 is able to recognise a band at 115kDa corresponding to the long isoform of HIRA/HIR and a band at 89kDa, corresponding to the short isoform of HIRA/HIR. Publishing research using ab20655? Please let us know so that we can cite the reference in this datasheet. I am sorry this product did not perform as stated on the datasheet and for the inconvenience this has caused. As requested, I have issued a free of charge replacement with the order number 11111111111. I definitely want to give it (ab20655) a shot. However, do you know why the predicted size of HIRA is different detected by two different antibodies? In the data sheet, the HIRA detected by ab20555 is 89 kDa, while it is 112 kDa byAb129169. I have checked SwissProte, and it seems that there are two isoforms: one with 112kDa, and one with 89 kDa, which would match perfectly. You canfind the database link on ourdatasheet. At present we have not been able to detect full length HIRA: 112KDa as defined by the SwissProt reference P54198." This answer can be found within the Scientific Support Tag on our datasheet. 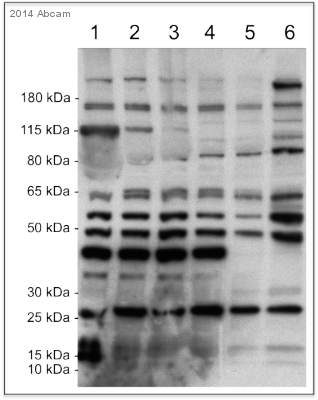 Please let me know if you still want to try the ab20655 Anti-HIRA antibody. Dear Sir/Madam, I am interested in having an antibody against HIRA. I have found your HIRA antibody (ab20655), but I slightly confused because on the picture shown in your website, the size of the bands detected don't match the size of published HIRA. Am I missing something? Please let me know if you can help. Many thanks. Best regards. Thank you for your enquiry. I have been in touch with my chromatin business development colleague and the size of the band that this antibody detects (89KDa) can be explained by the splice variant shown at the following SwissProt link: http://us.expasy.org/uniprot/P54198-2 At present we have not been able to detect full length HIRA: 112KDa as defined by the SwissProt reference P54198. I hope this information helps, please do not hesitate to contact us if you need any more advice or information. Dear Sir/Madam, I am interested in having an antibody against HIRA. I have found your HIRA antibody (ab20655), but I slightly confused because on the picture shown in your website, the size of the bands detected don't match the size of published HIRA. Am I missing something? Please let me know if you can help. Thank you for your enquiry. Ab20655 recognises a band at 89kDa which corresponds to the short isoform of HIRA. This band was specifically blocked by the immunising peptide. I hope this information helps, please do not hesitate to contact us if you need any more advice or information.